Orange Chicken - Crispy, sticky chicken in tangy orange sauce that takes 30 minutes to make and is much better than Panda Express or takeout. This chicken is the poster child of American-Chinese cuisine. If you walk into any Panda Express or Chinese takeout restaurant, you’re sure to find it on the menu. While sometimes called Orange Peel Chicken, it is the same thing. However, General Tso’s Chicken is not the same. While both are deep fried, General Tso’s chicken is usually a lot spicier. Furthermore, this specific chicken is made with an orange peel. This chicken recipe is extremely delicious and flavorful. Chicken breast is used to make crispy deep-fried chicken coated in a batter, with a sweet, tangy and savory orange sauce. It’s citrusy because of the orange juice and zest in the recipe. It’s also mildly spicy because of the chili sauce. The key to the best orange chicken lies in, not surprisingly, the orange sauce. The ingredients are easy to find. It calls for orange juice, orange zest, soy sauce, sugar, apple cider vinegar and chili sauce. Therefore, it’s sweet, sour and salty with a little bit of heat. You can make a big batch of the sauce and keep it in the refrigerator. How Do You Prepare the Chicken? First, you prepare the sauce by mixing all the ingredients in the sauce. For the chicken, you want to deep fry using my special batter recipe. Finally, using a wok or skillet, cook the orange sauce mixture until it thickens, then add in the deep-fried chicken. Stir to combine well and dinner is done! Easy Orange Chicken - crispy chicken in tangy orange sauce with vinegar, soy sauce, sugar and chicken broth. 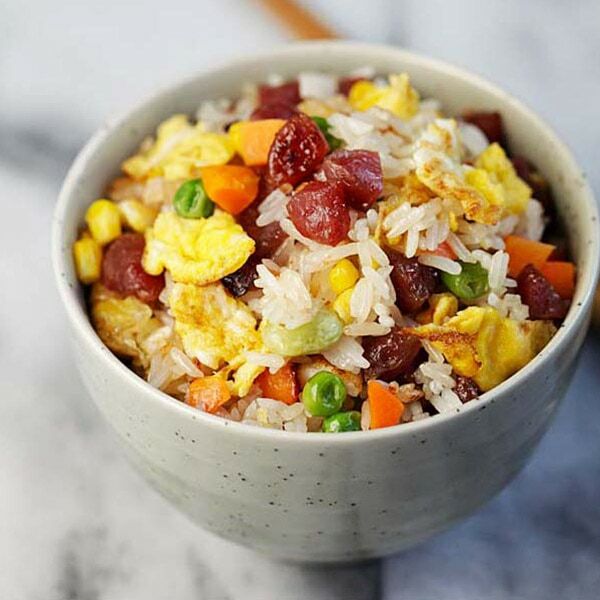 Takes 30 minutes to make and much better than Panda Express or takeout. In a bowl, mix all the ingredients for the Orange Sauce together. Whisk to combine well. In another bowl, whisk all the Frying Batter ingredients until the batter is smooth. Drop in the chicken cubes, coat well and set aside. 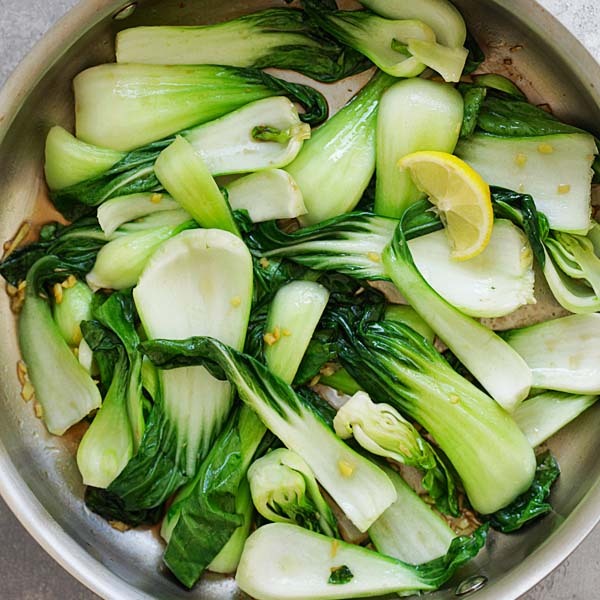 Heat up a wok or non-stick skillet with oil. Gently drop in the battered chicken cubes, one by one, making sure it is spread out to prevent sticking and over crowding the wok or skillet. Deep-fry until the chicken pieces turn golden brown and become crispy. Remove using a strainer and drain on paper towels. Transfer the deep-frying oil to a container and keep 1 tablespoon in the wok or skillet. Add the garlic and stir fry until aromatic or light brown in color. Gently pour in the Orange Sauce mixture, stir, and bring it to a light simmer. Toss in the deep-fried chicken, stir to combine well. Dish out, garnish with orange slices, top with white sesame and serve immediately with steamed rice. We had a dish called Orange Sesame the other day, so I’m going to try out your recipe, and throw in some roasted sesame seeds. Thanks! I cooked another version of orange chicken with whole chicken thighs a few days ago, but I didn’t use dried chilli. Your version looks really good! This recipe works well for fish also! I noticed that you have baking soda in the frying batter. Does baking soda provide more crispiness? I normally use only egg white, corn starch, salt & pepper. Wonder if we can find canned chicken broth in malaysia? that would make life sooo much easier dont you think? I think I saw it in Cold Storage before. This seems like a variation of Lemon Chicken eh… Nice yummy-looking photo! Looks good!! I also like to have some toasted sesame!! I know what you meant by the chinese food like Panda Express.. it’s just disgusting.. same like some chains in london … horrible..
Best to make at home!! Finally, a great looking orange chicken recipe. I think the real orange zest would be delicious in it. many things are better when made at home lol! a while back i had a friend of mine bring back a “authentic” chinese cookbook for me from his trip to china. it was in chinese and in english and if i remember correctly there was a recipe for orange chicken. i have to check it out later. this looks great. i like adding fruity flavors to chicken. Your dish looks very appetizing. I dun mind to eat it but will not cook it bcos I dun like deep-frying. I made this dish last night….. it was a HIT!!! I had some with the dried orange peel (wow), and lots of dried chilis the other day. What a difference from the Panda Express orange chicken that seems to set the popular standard. Thanks for sharing the recipe, Bee. I love to eat this dish but whenever anything involves deep frying…I just don’t like to do it at home. Do you re-use the frying oil for your next dish or simply throwing it out? Fresh oil is ALWAYS better than re-used oil, but if you fry chicken in used chicken oil, fish in used fish oil, beef in used beef oil, etc., you should be OK for a couple of re-uses. After two or three re-uses, just chuck it and use fresh oil. While the price IS going up, it’s just not worth getting your recipe prepared then finding out that the oil was funky. Better safe than sorry. I just returned from a wonderful 2 weeks holiday in the US and hey, say what you like (you’re spoilt rotten!) – the chinese express/take-ways in America is much nicer than the ones they have here in the UK. At least when I go to any food court over there and order something as simple/butchered as the Orange Chicken, I can actually finish the meal without complaining and mumbling about how they managed to “westernised” a chinese dish. I had a feeling to make this dish but didnt know if it existed coz the common one is lemon chicken, not orange. Anyway, found your recipe here instantly when i googled. Love the recipe. Tried it and it is such a hit! i find it even better than the lemon chicken! I read so much about Panda Express and was even going to try and make their chicken (I live in Canada, we don’t have Panda E. here). I should have known that almost without exception, food from a chain tastes horrible. Can’t wait to try this, thanks for posting it. PS What would cooking be without hoisin and soy sauce and the like? Can’t imagine. I tried this at home nut stir fried (rather than deep fried) the chicken (without the batter). I then poured the sauce over the chicken and it tasted great. AMAZING! I just made it for my roommates and they all loved it. Natalie – that’s great. I am glad your roommates loved the orange chicken. I’ve tried this recipe last Sunday – my husband loved it. Thanks for sharing this recipe. I just made this tonight. It was absolutely delicious! Thanks for the wonderful recipe. The whole (picky) family loved it. You have to buy the dried orange zest at Chinese store, if not, just peel the orange skin and dry in the sun. You can skip it if you want. 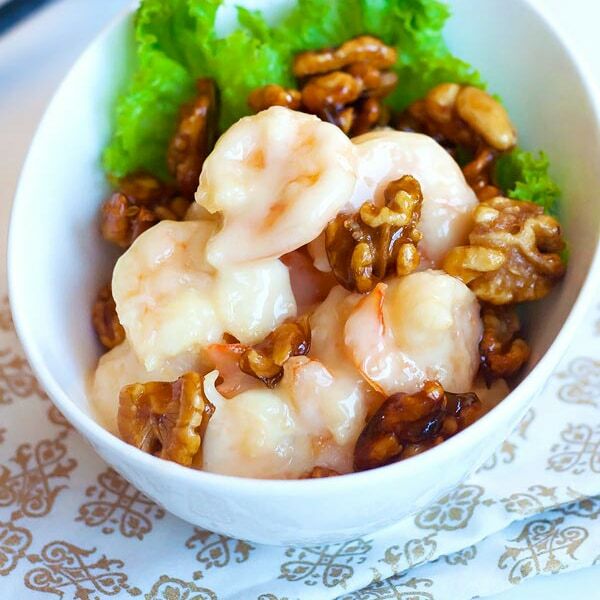 I just discovered your blog when I Googled cashew chicken, and let me tell you it is my greatest discovery! This week I made cashew chicken, kung pao shrimp, and orange chicken. All of which have been fantastic. Do you serve all these with rice? I’m a little riced out. Mongolian beef is on tomorows menu. Can’t wait! how spicy is this dish? I prefer low to moderate spice….DO the chiles take it ocer the top? Doug, this dish is not really spicy. The recipe looks delicious! Any idea if we need to marinate the chicken before cooking it? I made this dish last night & my husband of 26 years said it was the BEST dish I’ve ever made for him ( i do consider myself a pretty good cook) Will definitely make this again. This dish was delicious! The flavors seemed so balanced! I will admit that, as an American, I would like about two-three times the amount of orange sauce. Next time, I will make more! As a western guy I would have to disagree with you there. One of the reason why they scream so loud about unhealthy chinese food is all the sodium and things we consume in those heavy thick gravies in restaurants. Bee’s recipes in my opinion kind of reflect the principles of chinese food, in a more “authentic way”. But however, we are all free to have our opinons. I tried the recipe.. The taste came out great… However, the chicken didnt look good… gooey messy… seems something wrong with my batter.. or the way I fried the chicken??? coz not only it wasnt crispy in d beginning, d batter just didnt stick to the chicken.. so as I stir fry, all came off.. :( what went wrong??? Hmm, it didn’t happen to me. Did you pat the chicken dry? Well, make sure you have a thick coating of the batter and you can also fry the chicken twice, fry once when the batter is set, dish out and wait a little, and then deep fry again to get it to golden brown and crispy. Btw, have you tried to also just leave the crispy cooked chicken peases on the plate and just spoon over the sauce?. That actually did the trick which caused the same problem with sweet sour pork few years back. Besides another thing I learned about batters, the chicken pieces shouldn’t come too easily off your fingers. If they slip off too easily the batter is kinda too thin. I just made this for the first time tonight. It was excellent, the batter (something I’ve never done in all my years cooking) came out very authentic tasting. I did a few things different from the recipe though, being as I don’t have a wok or a deep fryer. First off I had to fry the chicken in batches in my large nonstick cooking pot (ol trusty! ), which took a while longer than expected. Then, since I decided to add frozen broccoli into the recipe (only way to get my husband to touch a veggie) I doubled the sauce. Overall it was a big hit, my husband scarfed the broccoli (Kodak moment in this house, let me assure you) and my picky toddler actually ate all her chicken and then some. The only thing I might change next time is changing out some of the regular sugar for some brown sugar, as brown sugar tends to add a depth of flavor that I think the dish might have been lacking. To save calories and time I might just try frying the chicken without any coating in the garlic/ginger/zest seasoned oil. Thanks so much for sharing this wonderful recipe, it’s a real treat and I’ll definitely be adding it to my rotation of weeknight recipes. My family thanks you too! Taryn, how do you know when the chicken is ready? I’ve never fryed anything before and I’m also going to use a large non-stick pot. The chicken should be ready after deep frying for 1 minute or so in high heat, since they are cut into small pieces. Another indication is when it turns light brown to golden brown (the batter coating). Thank you for the recipe. Dinner was delicious! I’ll be waiting for you’r reply. Highlight the recipe on your computer. The area you want to print out should be blue. Check the Print Preview to make sure you have it all and are not printing 23 pages. If the preview contains the information you want, then continue by pressing Print. You can do this in any web browser. You never need to hunt for the “Printer Friendly Version” ever again. This might be an odd question, but for the Chinese Rice wine should it be white or dark? Also, what rice vinegar should I use regular or seasoned? Thanks! Can’t wait to try the recipe. Chinese rice wine (Shaoxing wine) is amber in color. Rice vinegar is Chinese rice vinegar, which is clear in color. Thanks Bee for the recipe! It turned out great. I can’t wait to try more recipes! But I’ve never seen chicken broth pop up in any of them before. Kind of strikes me as odd to use a meat flavor in a sweet sauce but hey, maybe that’s why its not right yet. If I’ve got some here I’ll be sure to give it a shot. I have a question. I just made these last night and it didn’t turn out crispy. Even before I added the sauce…what do you think I am doing wrong? may i ask can i use lemon instead of orange? Yes, but lemon is a lot sour than orange. Did anyone actually cook this? You all have comments about how it looks – How does it taste?? I guess I will have to make it and tell those people who want to eat it how it is. 63 comments about…..? Lala we make it all the time because I don’t like to purchase restaurant foods. It’s DELISH! I have always enjoyed your website. Very easy-to-follow recipes and I have tried both your sweet & sour pork and orange chicken recipe. Fabulous and my husband loves it. Thank you for sharing and looking forward to more of your posts. Love your recipes, but I can’t get the link to work for this tempting orange chicken! Can you please check? Just made this. Actually, just dipped in a flour and cornstarch mix instead of using the batter for the chicken, but used your recipe for the sauce and for how to finish with the garlic and ginger saute. I tripled the sauce because I had a pound and a half of chicken. And I forgot to add the chicken broth, woops. Turned out yummy! Wasn’t that crispy though, so maybe I’ll try your batter next time. I am at your website, but I don’t see the recipe for orange peel chicken. Could you please email it to me? Click on page 2 at the bottom for the recipe. I don’t see the recipe either, nor do I see a page 2. It says the recipe is on Page 2 at the bottom of the page. verdict from family: FINGER LICKING GOOD! Personally I would use chicken as a substitute for pork rather than beef, but if you would rather use beef, I’d go for a lean cut like slices of tenderloin. I have tried four or five recipe. They are all amazing and yummy. Most are very easy to make. I absolutely luv your blog and look forward to my next fave recipe. I also use your recipes when I want to impress my guests. thx so glad I stumbled upon this. will have to try! btw that baking soda marinate thing is super JENG so glad i found ur blog. This dish didn’t come out good for me. The chicken ended up mushy with the batter falling off the chicken and scattered in the sauce, not good. What can I do to avoid this and have a crispy chicken? Would it be better to add the chicken after the sauce have been thickened? The chicken appeared to be crispy prior to adding it to the other ingredients. Yes, you can, you can fry the chicken twice to make it crispier. I’m a fan of The Big Bang Theory TV series, and in there Sheldon often orders Tangerine Chicken, thats the reason I searched for that or Orange Chicken recipes because I never had it before. Now I’m grateful that I have found your site, I love all types of Asian cuisine so I will come here often to try out something new! 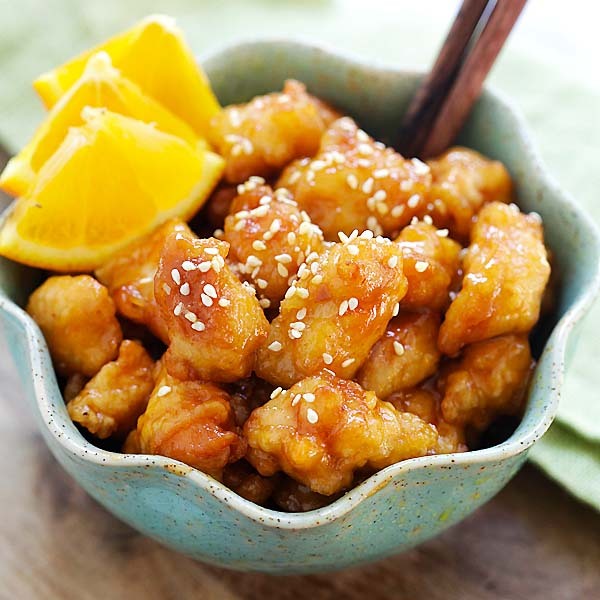 this recipe looks easy & delicious, orange chicken/lemon chicken are 2 of my favorites! however im trying to minimize the fried food my family eats (plus i hate the time, waste & mess of deep frying). Have you ever modified this recipe to work with plain stirfried chicken rather than deep fried? If so, how did it work? I know some modifications simply don’t translate. I baked the diced chicken, then added it to the sauce. My kids asked me to make again. SO glad to have found this awesome site! I have mnade several dishes and have yet to been disatisfied! Really enjoyed the Orange Chicken… used prebreaded popcorn chicken..( thought i had fresh :( ) but still turned out delish!!! How many serving can this recipe make? I had beautiful, crispy golden chicken but it all turned mushy while cooking the sauce. The flavors were great and my family still enjoyed it but if I were to make it again I’d try cooking the sauce and let it thicken and cool slightly THEN pour it over the chicken. We have several satsuma trees here in LA, can’t wait to try with them instead of orange or tangerine juice/zest!! Hi, I live in Europe and I don’t have access to rice wine or sherry, neither do I have rice vinegar. Can I substitute them for something else or should I just leave them out? Skip wine and use lemon juice for vinegar. I sometimes use Gin for rice wine or sherry. Great presentation of the dish. I’ve gotta learned your photo skills. For the orange sauce, I often see people recommending mixing corn startch with water first before adding to sauce. Should I do that for this recipe? Thank you for sharing your recipe. I made it tonight. My foster son is visiting and orange chicken is his favorite. The batter fried up so beautifully. It was a gorgeous and airy. Then when I added the sauce and continued to stir fry until thickened as the recipe says to it was ruined. Chicken turned mushy. I also found it to be lacking in orange flavor. I am going to try again though. Add more orange zest to amp the flavor. Maybe if I do not stir fry the chicken with the sauce but instead pool some of it in the bottom of the serving platter and then drizzle the rest over the top it won’t turn to mush. This was a lot of prep work and took forever (mostly because I tripled the recipe and had to fry in tiny batches…) but the flavor was absolutely divine. The peppers, even seeded, gave this dish a lot of kick. I thickened the sauce before I tossed the chicken back in so it wouldn’t get soggy and also made a batch with unbreaded shrimp for my pescetarian daughter. Fantastic recipe. Great chicken preparation! I’ve followed several recipes following your instruction and those were great also. Thanx for putting so many recipes in a place. Cheers!! love your recipes but your site is very slow to load (took almost 1-1/2 min. to load orange chicken recipe)I know it’s not on my end (checked it out many ways) is it because your using wordpress or your just trying to upload way too much c**p on your site. still love your recipes. Hi where are you viewing the page from? My site loads very fast for me, and if it does load slow, it’s because of external ad calls of the ads which I have no control of. A new redesign is in the work which will speed up overall load time. Thanks for your patience. I love a lot of you recipes. I would probably love all of them, but I’ve only cooked a lot of them. I’m making this one tonight for my picky daughter, that I’ve noticed ordering this when we go out. So, the reason for my comment, (other than to say thanks), do I really only use 1/2 an egg for the batter? I have to say this is the first time I have ever been asked to use only half an egg. I’m assuming I beat the egg before adding half of it to the batter? Beautiful wok kitchen, btw. You should do a few videos. This sounds so much better than the recipe I’ve been using. Recipe is great except according to measures batter is to thin, made it thicker, but do not put chicken in to it and stir fry it. The batter will fall apart instead after you have put orange zest, add the sauce and thicken it in wok and pour over the chicken and serve. While cooking chicken in batches remember to keep cooked pieces in the warm oven. I cringe to admitt it,but I actually enjoy that sticky, gooey, overly sweet mess that Panda Chicken serves up. However, your recipe definitely “tastes” better in my mind. Orange Sauce + Sesame Oil? Yes, yes, yes! Sweetbreads? This recipe looks like it will produce a delightful result if I use sweetbreads in place of the chicken breast. Your thoughts? Have you tried doing sweetbreads a l’orange in any fashion? I have been frustrated in my search for a recipe. I had the dish a couple of times at the Rainbow Room in 1970 (yes, I am that old) and it is spectacular! Since then I have not been able to find a recipe nor other restaurants that feature it. Laura, you can add a little bit of that to the recipe towards the end. I read what you had to say about the Orange Chcken and I appreiate the info. I have never cooked it before, but I will try your recipe soon. I know you live in the Orange County area, so I wanted to give you a place that my wife and I like to go for the best Chinese fast food Orange Chicken. Its called “China Luck” and its in Fountain Valley in the same center as Islands and Albertsons on Brookhurst just south of the 405. Everything else is good there too and a few years back they got a good article written about them in the Orange County Register. Prices are also good. Yummy! On of my favorites! So I just made this tonight. It took me a great deal longer to prepare than the estimated time in your directions, but I think that had more to do with the fact that I have never made orange chicken of any kind before, so I was taking greater care to ensure everything was done properly. I absolutely loved the end result, but I was not expecting it to be as spicy as it actually ended up being (which was fine for me, I LOVE spice, and it was an unexpected surprise) though the rest of the group could not finish it. Next time I make it I plan to reduce the pepper. Either way, thank you for this amazing recipe! I am planning to try the Honey Soy Chicken Wings next, and I can’t wait! It is a good idea. It is easy to understand I am to comment. I and my husband love all of your recipes, easy cook and taste really good!!! Thank you, Rasa. Uyen thanks for being a fan. I am so bummed out. I’m sure this recipe is good, but I liked the old recipe a lot. All of my friends and family loved it too. I don’t remember all the ingredients but I can see that this one is way different, as it doesn’t called for the dried chili peppers, and it calls generically for sherry or dry white wine instead of rice wine. Can you please please send me a copy of the old recipe? Every time I try to print 1 of your recipes it comes out in Chinese, which is weird when it is in English on the computer. Hi Dorothy, I am sorry to hear that, it looks like it’s the printer driver issue, please save the recipe as a PDF first and then print out and it should be fine. I’m really looking forward to try out this recipe… But since I’m in Malaysia I don’t reckon we have Rooster brand. Can I replace it with another type of garlic chilli sauce such as Kampong Koh? Thanks so much for sharing! Yes, any chili sauce is fine. Just wanted to share – I made this last weekend for my mother in the hospital and made a few changes (used EVOO for cooking oil and stevia for sugar), paired it with steamed egg, stir fried yinchoy (Asian spinach) with wolfberries and quinoa instead of rice. My mother who didn’t have the best of appetites because of her illness ate quite a portion! I then made hand squeezed OJ right in front of her for dessert with the rest of the oranges that I bought. She just loved her lunch and her hospital room smelled of zest for the day. Thanks very much ! Hi Rasa, made this recipe and even though came out really good, the orange sauce was too thick. Not sure if I overcooked or if should I add more water next time. Definitively, I will try it again. Thanks for sharing. Add water if it’s too thick and yes you overcooked. This looks so delicious, unfortunately though I don’t eat chicken but the sauce sounds amazing so I might try it with white fish or tofu, hope it works! So, I tried this recipe and it turned out AMAZING!!! Thank you so much for posting this :) I do have a question though. In the directions for the batter, it says that you’re suppose to mix the eggs with the flour mixture. Is that correct? My mother-in-law cooks a lot, and she told me that I should dip the chicken in the egg and then into the flour. What is the correct way? What I ended up doing was mixing the egg in the flour mixture and then dipped the chicken… I thought this wouldnt fry well so I ended up putting it all in a plastic bag and added corn starch. This made it PERFECTTTT!!!! Again, thank you so much for posting! Glad you enjoyed the orange chicken. All recipes on this site are absolutely delicious. For the batter, I always mix the eggs with the flour and it works very well. Best is to use only egg white and discard the egg yolk. Orange chicken is one of my favorite dish. It looks so delicious in those pictures. Definitely better than the restaurant version!!! Your batter recipe looks like a classic Japanese Tempura batter except that the Japanese recipe uses Cake Flour (low-gluten) instead of All-Purpose Flour, Potato Starch (Jap. “Katakuri-Ko”) instead of Cornstarch, and ice-cold Sparkling Water or Club Soda rather than just plain old water. My 14 year old son loves to cook and we have trying new recipes together. We’ve had some hits and some misses. But this recipe was a 10 out of 10 success with all of my 4 kids and their equally fussy father. It was delicious. We can’t wait to try some of your other recipes. Thank you. I absolutely love this recipe. It’s easy to prepare and doesn’t take much time. Thanks Kay, I am happy you love my orange chicken recipe. Hi Jaime, the batter shouldn’t be thick as molasses. If it does, some measurement must be off. Yum! I love orange chicken. Your recipe looks super simple and delicious. Thanks for sharing. Yes this is the best orange chicken you will find online. This is the best recipe! My daughter and I have made it several times. Hi Jennifer, I agree. You won’t find a better orange chicken recipe online. It’s unfortunate that Google always show the not-so-great recipe at the top of search results.